Many people spend years working themselves into the ground, only to be passed over for the promotions, recognition, and pay raises they deserve. Today, there is a new set of unwritten rules for getting ahead, and they are all about making an impact. 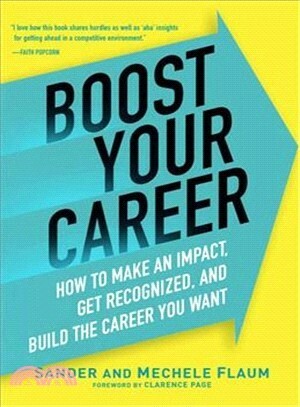 In Boost Your Career, Sander and Mechele Flaum expose what many people have taken years to learn: Success depends on the "impact dynamic." Defined as projects that make a resounding difference in an organization, with the added benefit of impressing key stakeholders, the impact dynamic is what separates over-deliverers from average workers. Drawing on their many years in business in a variety of high-level roles, the Flaums teach readers exactly what they need to know in today's job market: how to identify opportunities and successfully lead projects that will propel their careers. Packed with real and exclusive stories from seasoned professionals, newbies in big roles, and entrepreneurs in a variety of industries, this book shares the hidden hurdles, aha! moments, and tips for getting ahead in a competitive environment. Whether you've been at the same company for twenty years, you're starting a new job tomorrow, or you own your own business, Boost Your Career will make a resounding difference in how you view your professional role and frame your accomplishments. As a leadership-effectiveness consultant, chair of the Fordham University Gabelli Graduate School of Business Administration's Leadership Forum, and contributor to American Management Association, Sander Flaum has been using his impact insights to advise industry-leading clients for many years. His coauthor and wife, Mechele Flaum, has led a career in marketing trend identification and consumer consulting that has interfaced with many vibrant professionals seeking to make a difference in their careers.